Macleod Football Netball Club was saddened to learn of the passing of Peta Oates last Friday. Peta made a significant contribution to Macleod Junior Football Club during the 1990s, taking on the role of president, the only female in the club’s history to hold that position. This was a crucial time as the junior club established its first major link with the senior club. With others, Peta helped establish a successful under-19s team that is still thriving thanks to the foresight of the junior club, and the senior club embracing the relationship. Sadly, Peta’s passing comes just seven months after we lost husband John. 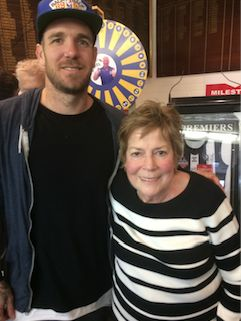 Together they were familiar faces on game-day and at functions (Peta enjoyed meeting Dane Swan a few years ago!) and were much loved members of the Macleod sporting community. To daughter Rebecca and son Tim – a former under-19s player – we send our deepest sympathy. Funeral arrangements are to be advised.